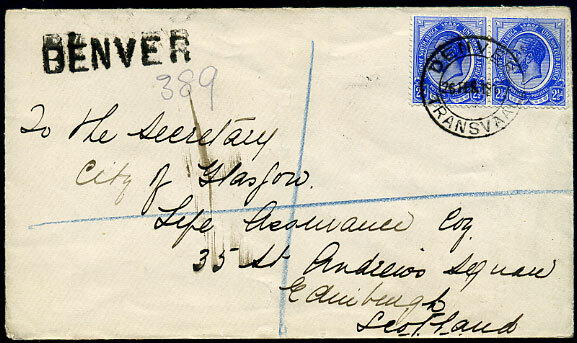 1916 Leewards KE7 2d PSRE with added KGV 1d to Sheffield pmk'd */MY 19 16, album page backing paper adhers to whole of reverse, rarely seen cancel. (R1) B/18 DE 19 tying KGV 1d (SG.87b, corner perf. 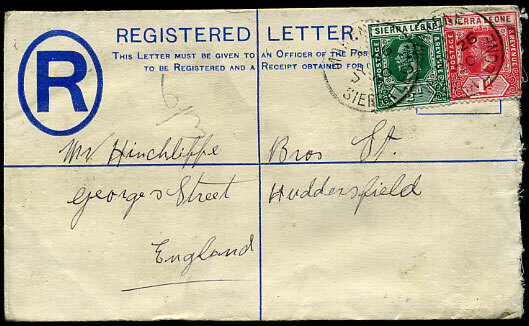 fault on KGV 2d PSRE (damaged flap) to Huddersfield. 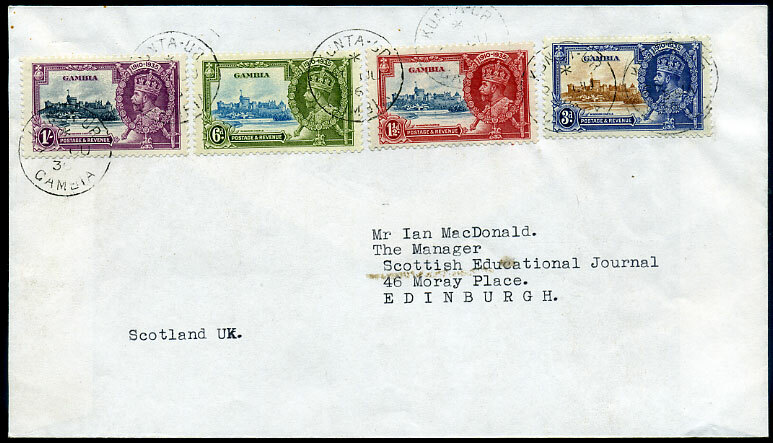 dated 23 JU 36 tying KGV SJ set of 4 values on cover to Edinburgh. 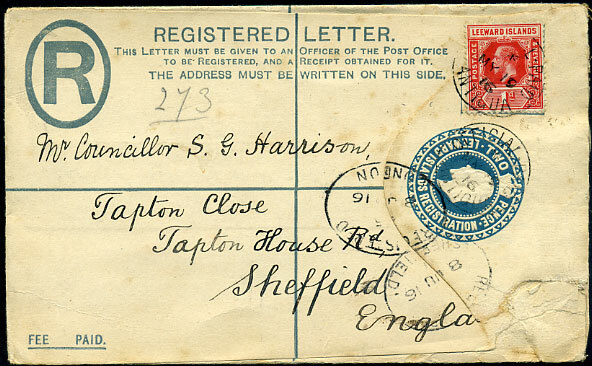 (011.01) A/AP 6 26 tying KGV 1½d (SG.133) added KGV 3d PSRE to Huddersfield, boxed h/struck TRAVELLING P.O. reg. 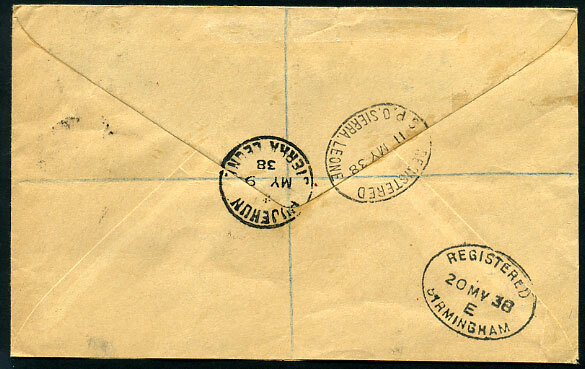 h/stamp No.246, some top left corner damage, opened 2 sides. 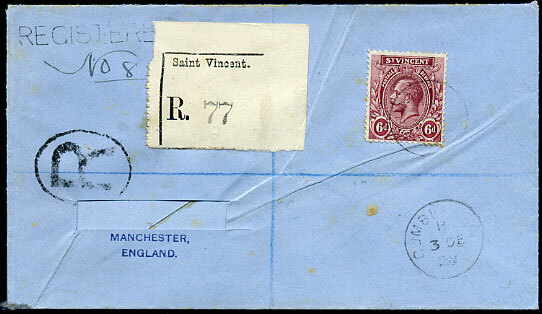 B/3 DE 28 on KGV 6d (SG.137) cover to Manchester (excised name) showing str. line "REGISTERED" (applied village), some creasing and toning. 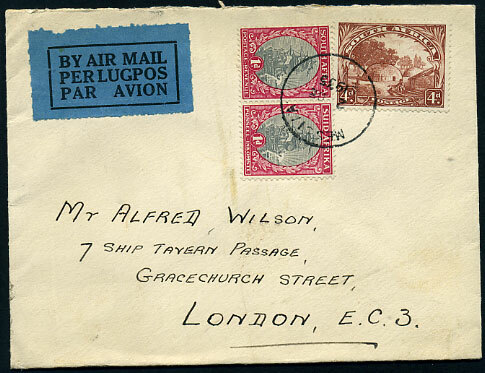 1929 cover from C.S. 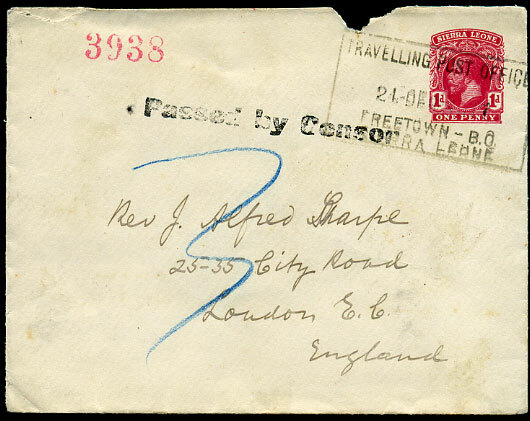 Jones, Grand Turk (per flap) with KGV 2½d (SG.180) tied purple boxed K.N.S.M. 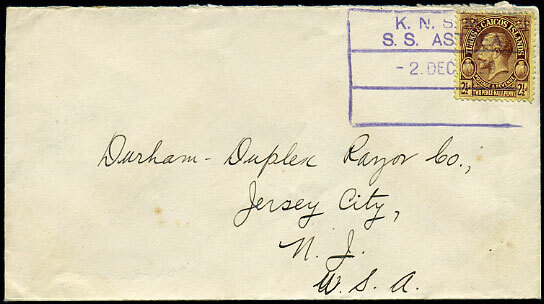 S.S. ASTREA handstamp dated 2 DEC 1929 to Jersey City, USA. 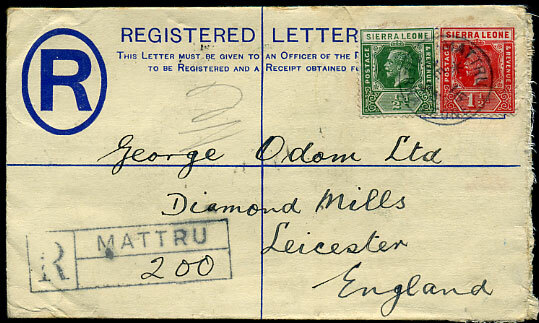 skeleton dated 2 DE 1935 on South Africa 1d pair, 4d cover to London. 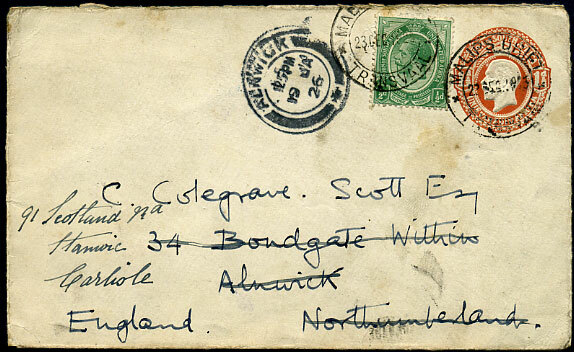 23 DEC 1926 on South Africa KGV 1½d PSE with added KGV ½d to Alnwick re-addressed Carlisle, some soiling. 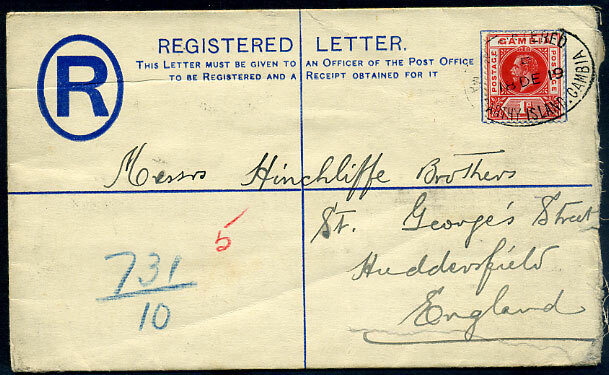 (099.01) */JY 26 20 tying KGV ½d, 1d (SG.112,113a) added KGV 2d PSRE to Huddersfield, reverse handstruck MAKENE reg. 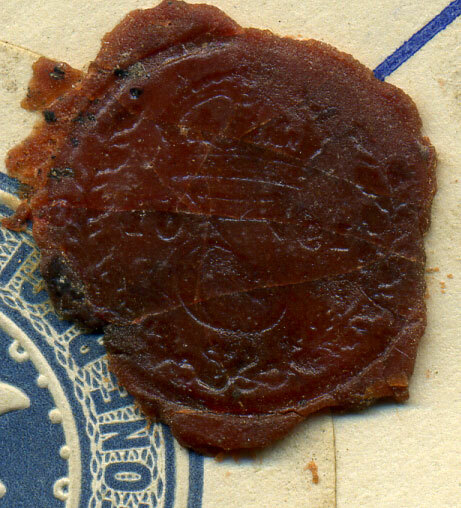 h/stamp and coin-type 3d bit wax seal with Crown over "3" flanked by 19 and 01 all in reverse. 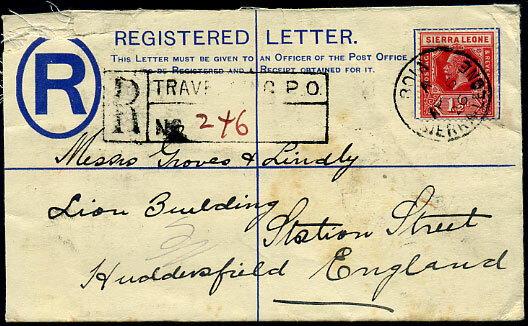 (106.03) C/AP 8 20 tying KGV ½d, 1½d (SG.131,133) added KGV 2d PSRE to Huddersfield, handstruck boxed MANO reg. h/stamp. 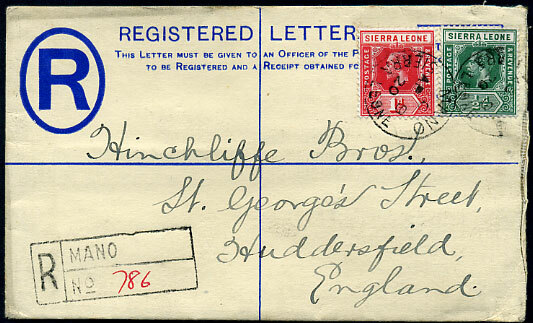 (106.03) C/FE 7 18 tying KGV 1½d orange (SG.114) added KGV 2d PSRE, opened 2 sides, to Huddersfield, handstruck boxed MANO reg. h/stamp. 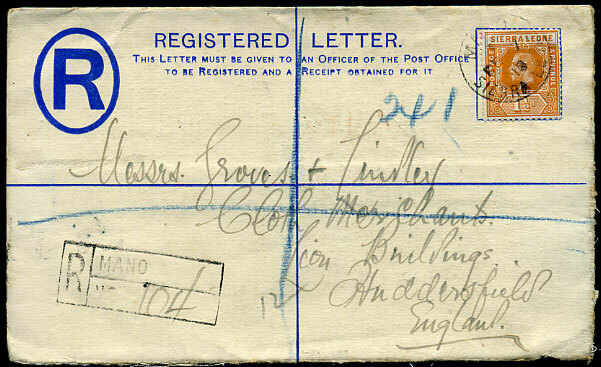 (112.02) */DE 16 25 tying KGV ½d, 1½d (SG.131,135) added KGV 3d PSRE to Leicester, boxed MATTRU reg. h/stamp. (T.21) */MR 13 22 tying 2 x KGV 2c (SG.273) on home-made cover to Colchester, some edge soiling. 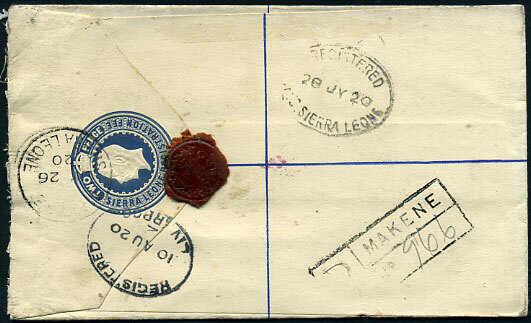 (T.7 I, D4) 30 JUN 31 tying KGV 1d (SG.116) on large piece local cover front. dated 6 MR 20 tying Union KGV 6d on reg. 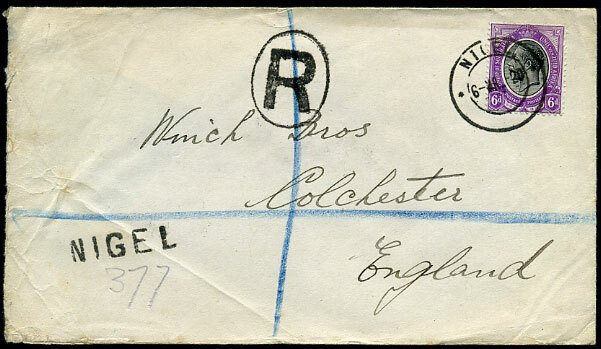 cover to Colchester, fine NIGEL str. line reg. 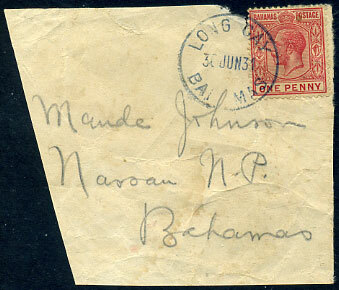 h/stamp, one reverse side flap removed. 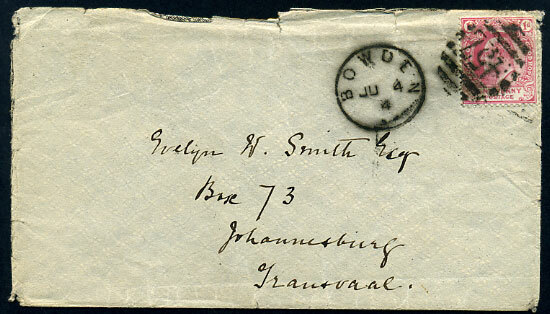 on KE7 1d rate cover to Transvaal dated JU 4 4, peripheral faults and opened 2 sides. 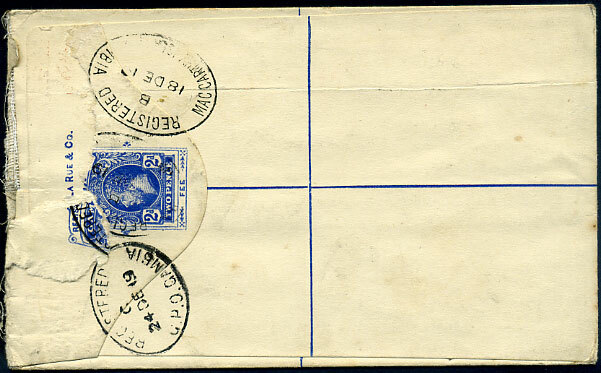 (051.03) dated C/MR 9 22 tying KGV 1d, 2 x 2d on reg. 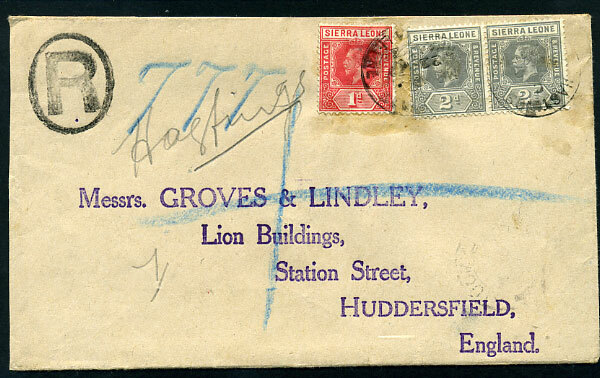 cover to Huddersfield showing manuscript "Hastings" reg. etiquette in pencil. Some soiling, opened 2 sides. 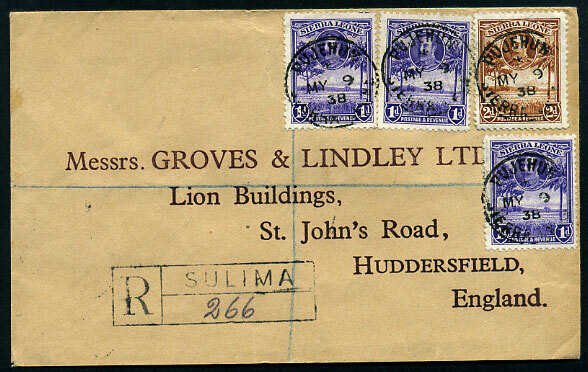 (129.01) */MY 9 38 tying 1932 KGV 1d x 3, KGV 2d on cover, opened most 2 sides, to Huddersfield, most unusually with boxed SULIMA reg. 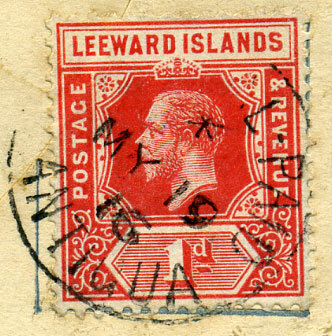 h/stamp. 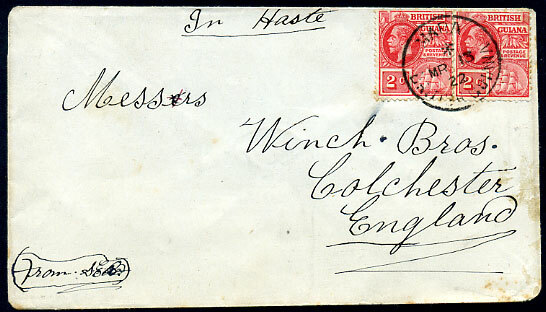 (202.01) on full KGV 1d PSE dated 24 DE 1917 with "Passed by Censor", small piece at top lost during opening.